At the beginning of this month, a new member of Goshen College was welcomed to campus. It was not a new student who finally found their way to Goshen, or a professor coming back from sabbatical, but instead, incoming President Rebecca Stoltzfus. On November 1, Stoltzfus made a tour around campus to take in the sights and sounds as well as interact with students and faculty she encountered along the way. Stoltzfus is looking forward to diving into the campus community and getting to know people and she did just that on her first day. Armed with boxes of donuts, the president toured the college and extended a tasty welcome to everyone she met. Stoltzfus said that she needed a way to greet the campus and that Jodi Beyeler and her staff in the Communication and Marketing department came up with the idea of using donuts as a way to do so. For her first year in office, President Stoltzfus has four goals she hopes to accomplish. The first is to build trusting relationships with faculty, staff, students, and the board of directors. The second is to be developing additional revenue streams for the college. She stated in the past, there was the idea of just meeting the annual budget. Instead of doing just that, she hopes to find ways to exceed just meeting the minimum so Goshen can grow. 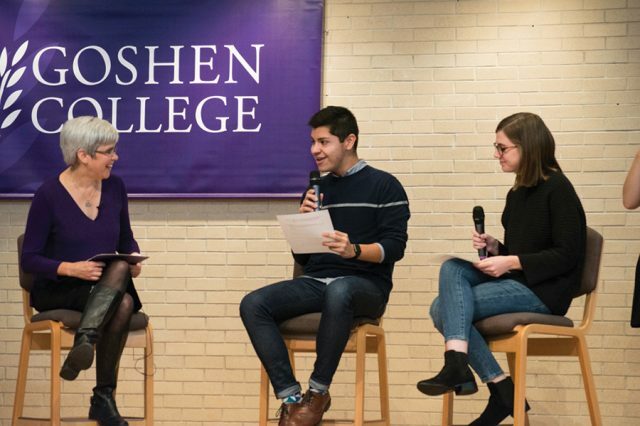 The third goal is to craft a new narrative about Goshen College: “Who [we are], where are we going, and why people might want to be a part of [the college].,” Stoltzfus said. The fourth and final goal is to work to strengthen governance of Goshen at all levels. 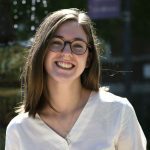 “I’m interested in student governance, faculty governance, the administrative governance of the college, our relationship with the board of directors, and the Mennonite church,” Stoltzfus said. Stoltzfus is nervous about what every first-year in the first month of college can relate to: learning everyone’s’ name. Stoltzfus, a 1983 graduate, majored in Chemistry at GC. She hopes to apply the skill she learned as a researcher in the chemistry field to her presidential position by asking questions and finding the answers to them. While she attended Goshen, she took piano lessons, and really enjoyed closing the door and enjoying the quietness of the music practice rooms. Stoltzfus cherishes this same type of quietness now, stating that she is an introvert by nature. Stoltzfus looks forward to thinking in her office with the door closed, similar to when she spent quiet times in the practice rooms. But don’t think she’ll spend all of her time in her office. Stoltzfus spoke in convocation on Wednesday intended to introduce and welcome her to the student body. In this convo, she spoke on her four goals for this year, and was interviewed by sophomore Abby King and senior Dez Lopez. The convo wrapped up with an acknowledgement of Ken Newbold for his time as interim president, as well as a welcoming from him to Stoltzfus.